Founded in 1921 and now based in Ascoli Piceno (Central Italy), today Sabelli Group is one of the leading family-owned dairy companies in Italy. The group is mainly specialized in the production of mozzarella cheese, gastronomic specialties, ricotta and other cheese products. Today, Sabelli Group achieves consolidated revenues of more than US$200 million. 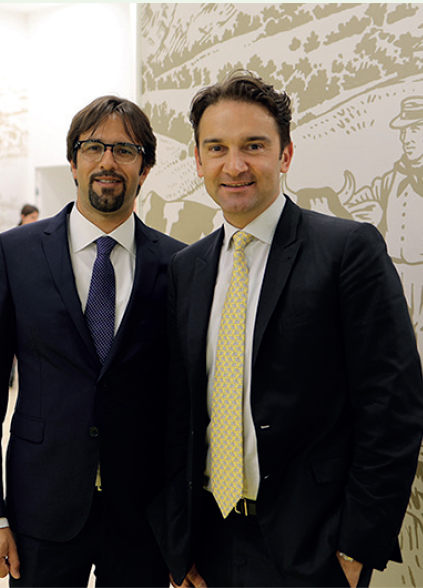 The success of Sabelli Group, nowadays managed by Simone Mariani and Angelo Galeati — the sons of the two Sabelli sisters — started with a significant and ambitious expansion plan aimed at extending its existing product range to include fast-growing cheese products, as well as increasing its exposure to foreign markets. This plan culminated in 2016, when Sabelli — advised by Oaklins’ Italian team — acquired Trevisanalat, a leading private label mozzarella cheese producer, giving birth to the second largest production group of table mozzarella in Italy.During 2018, Sabelli Group completed the second M&A transaction in its history — as always, advised by Oaklins — with the acquisition of Caseificio Val d’Aveto, a company that produces typical Ligurian cheeses and strained yogurt. The cheese industry, like the dairy industry in general, is dominated at global and local level by various, well-known multinationals. How was a family-owned company like Sabelli able to resist this competitive pressure and stand out in the Italian market throughout its history? It has been crucial to focus on what has distinguished us since the beginning of our history: the high quality of our raw materials, the freshness of our products and the manufacturing know-how developed throughout our long history, combined with the continuous innovation of our plants and equipment in order to be at the forefront of technological developments as they evolve. We decided to position ourselves in those product segments in which quality is a key factor in the consumers’ preference, such as burrata, stracciatella and high-end mozzarella. This strategy set us apart from the traditional competitive logic, based mainly on price policies. Then, we consolidated our position — becoming one of the leading players in this segment — thanks to our acquisition strategy, aimed at acquiring complementary companies rather than competitors. This choice introduced Sabelli to new channels and broadened its range of action. Your main products are fresh cheeses, such as mozzarella, burrata and stracciatella — products that certainly have a lot of traction in foreign markets. Can the reduced shelf-life of these products represent a limit to your current commercial firepower abroad? Foreign-market performance is currently the real growth driver of this sector. Hence, there is increasing attention to the innovation of technologies and processes in order to meet the specific logistics and transportation needs and to optimize the supply chain. Consumer preferences have changed in recent years. Now there seems to be a greater tendency towards private label products, which have registered unprecedented growth rates. How did Sabelli Group react to this shift in preferences? This specific trend has not caught us unprepared. In fact, in November 2016 we acquired Trevisanalat, a company located in Resana (in the province of Treviso), with the aim of strengthening our position as a partner in the large-scale retail industry. Trevisanalat — a company with a turnover of US$65 million in 2017 — has a strong and recognized specialization in the private label field, both in Italy and abroad. This acquisition, together with the acquisition of Ekolat in Slovenia, has enabled the Sabelli Group to open new distribution channels and reach new clients, allowing us to achieve strong industrial and commercial synergies capable of transforming this private label trend into an opportunity. Talking about trends, the market of free-from and organic products is growing, capturing more and more space on large retailers’ shelves. How does Sabelli Group perceive the growth trend towards lactose-free products? As a threat, or an opportunity to be exploited? Thanks to our innovation capabilities and our leadership in specific product segments, such as stracciatella and burrata, the healthy food trend has, undoubtedly, represented an opportunity to differentiate our product range in a context in which product quality is a more important factor to consumers. We were therefore the first to launch a lactose-free stracciatella and lactosefree burrata. The latter has also been awarded 2018 Product of the Year after a market research study involving more than 12,000 consumers. Thanks to M&A, you have become the second largest producer of mozzarella in Italy. What were the drivers that led you to undertake this important consolidation process in the fresh cheese sector? In order to face the competition of the larger dairy groups and to be more competitive in the international markets, we have understood the need to widen our range of action by acquiring complementary businesses capable of expanding our product range. After all, dynamism and entrepreneurial spirit have been part of Sabelli's DNA since its inception, and these are the factors that allowed an artisan cheese factory founded in 1921 to become, after four generations, one of the leading Italian groups in the production of mozzarella (the second in terms of volume, if we combine that of Trevisanalat and Sabelli). With your latest acquisition, you have added the premium yogurt brand Caseificio Val d'Aveto to your portfolio. What drove you towards a product that had never been in your product range before? The acquisition of Caseificio Val d'Aveto is part of our strategy of aggregating within our group the best companies in their respective Made in Italy food niches. In particular, it allowed us to integrate products that were missing from our portfolio — first of all, yogurt, but also San Stè cheese (traditional Ligurian cheese) — and to reach new customers and consumers in the premium segment. Moreover, we share many of our corporate values with Caseificio Val d'Aveto, such as links with the region, attention to raw materials and product quality, sustainability and, finally, family ownership. All of these characteristics, which have been part of our identity since our inception, are recognized and valued by all our interlocutors. In which other cheese industry segments do you see strong potential for future development, and which are (or could be) targeted by your expansion strategy? Following the path started with the acquisition of Caseificio Val d'Aveto, we will certainly focus on niches that represent production excellence and that can complement our product range. We also have plans to decisively increase our presence in foreign markets, so we do not exclude the possibility of strategic acquisitions outside Italy. In Italy, it is estimated that more than 85% of companies are family-owned. However, these entrepreneurs are often frightened by undertaking extraordinary transactions. What would you say to those entrepreneurs who are critical of M&A? As far as we are concerned, the acquisitions allowed us not only to grow in terms of turnover, but also to open up new distribution channels, reach new targets and expand our market. Of course, it is essential to choose the right partner, one that is consistent with your development strategies and your company's values. These are crucial factors in order to maximize your investment in M&A.